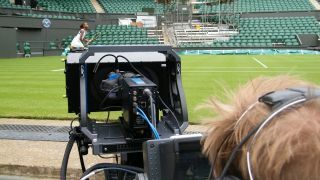 Catching the BBC's live coverage of Wimbledon is often tricky during work hours, but organisers are hoping to ensure those important service breaks and saved match points can be viewed by anyone with access to their social media feeds. The All England Lawn Tennis Club has confirmed it has formed a formidable doubles pairing with social video firm Grabyo in order to broadcast "near-live highlights" on Facebook, Twitter and Google+. The partnership will see between 25-50 clips posted to the social platforms every day, chronicling action from Centre Court and Courts No.1 and No.2, with each video lasting between 30-60 seconds. The idea is not just to keep those TV-less souls in the loop, but also to alert those who may be missing a five set classic while out in the garden to get themselves inside and chuck on BBC 2. Grabyo already has partnerships with Sky Sports, Channel 5 and Setanta Sports, but the Wimbledon deal represents the first time a major rights holder has "delivered real-time video highlights to a global audience across multiple social platforms," according to the start up's CEO Gareth Capon. Grabyo will also power extended highlights from the tournament on Wimbledon.com and YouTube, although that will be posted later in the day. Wimbledon gets underway on June 23. Come on, Tim!